My current deck, advice appreciated. I honestly doubt there's such a thing as MM in casual. As it seems completely random what players you'll face. To me it seems it has more to do with the type of people that are online when you do play casual. My initial Shaman deck and current (advice)? This is my current Bloodlust Tempo Shaman deck. http://www.hearthpwn.com/decks/60122-spellbound-bloodlust-tempo-shamanI'm curious what you guys think of it. Any advice is appreciated. Btw what Deck Type should i set for it? As it is controll with a very high burst with Bloodlust :D and with Doomhammer as a bonus.I understand this is mostly a gimmick but it's the best i can do with the cards i got atm. And it's a lot of fun. This is what i run atm:http://www.hearthpwn.com/decks/60122-funkys-f2p-shaman-deckIn this deck setup do you think there's still need for adding a Lava Burst? If so what would you remove? Why Do People Like Shaman! 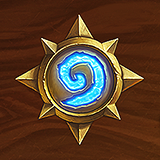 As a new player i really started playing shaman because of Trumps F2P shaman run, to Legendary. In which he exceeded, not surprising considering how skillful he plays.So far had a lot of fun with playing Shaman and i get the feeling it's a great way to learn the game. After all if you want to be successful in a shaman deck you need to know a fair bit about other decks/classes. It's that drive to get better that makes a great introduction to the game for me. Atm i'm still working on the skill and experience to kick a$$.